It goes without saying that if you're going to succeed online, that having the right Google keyword research tool(s) is paramount to your success. The same can be said for understanding the importance of competitive research as well. Dismissing the value of research is akin to walking around in the dark and well.. let's just say, we all know how successful that is. In my own research, what I've found is this one particular question. How do you make your blog popular ? Consequently, the same answer consistently makes it way to the table.. "Do your keyword research". There are many keyword suggestion tools, but the one that I'm going to talk about today in particular is Long Tail Pro. As I've stated many times throughout my blog.. I will "ONLY" suggest or review products that I feel add benefit to "you".. my readers and my audience.. the people that trust my word on the topics that I write about. In the way of keyword discovery, Long Tail Pro is currently the definitive and most trusted keyword suggestion tool online. You would be hard pressed to find a tool to search keywords for your niche, blog or website that does a better job to find keywords that are profitable and highly aligned to your project needs. Years ago, the common practice was to target 2-3 word keyword phrases because naturally that's where all the keyword volume was. It made sense to go after website keywords that offered tens of thousands of searches per month using any number keyword analyzer tools. However the problem was that in doing any basic keyword analysis, it was clear that ranking for those terms was going to be extremely difficult. Over time, the term "low hanging fruit" started showing up in keyword research and keyword discovery conversations. So what does this mean ? It means that people needed to shift their behavior from targeting high volume, high competition keywords to low volume, low competition keywords.. and that's exactly what started to happen. Keyword discovery became more focused on finding long tail keywords and that become the new norm. You can start out with Long Tail Pro by simply using the find keywords tool. You will have to create a project. 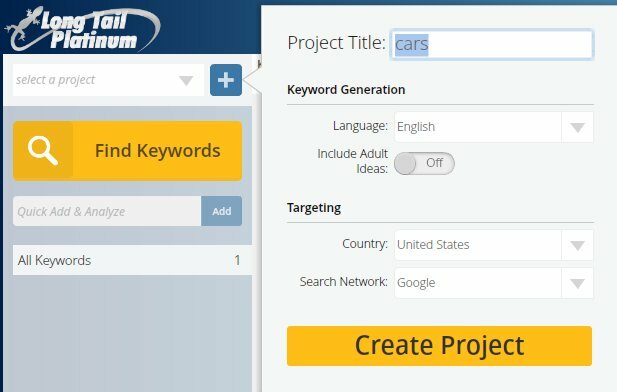 You can see that I've created a project call "cars". You should set your language (it's set to English by default). You can include "adult" ideas (the ticker is set to the off position by default). In your targeting options you will need to set your country and network. By default, these options are set to United States for the country and Google for the network, however you can make your own selections if you need to make changes there. Once you're done setting your options, click "create project". Once you've done that, you'll see the "add seed keywords" section. There are many options here, but don't let that overwhelm you. This is all very good for targeting and fine tuning your search. Once you've typed in your seed keyword (I've typed in "cars" for my seed keyword), click on add. It will be added to your seed keyword list. If you click the down arrow to the left of your seed keyword, you'll see two more options called "include" and "exclude". I always type in the seed keyword into the "include" section. This means I want to make sure that any keywords that the software produces "includes" my seed keyword. This is important so make sure that you do this. I find that it makes my searches far more accurate. If you want words "excluded" then make sure that you list those in the "exclude" section. For each word or phrase that needs to be treated individually, use commas as your separator. There's the "add my own keywords" section too and it's pretty self explanatory... just add your own keywords and Long Tail Pro will also produce keyword data for those terms too. 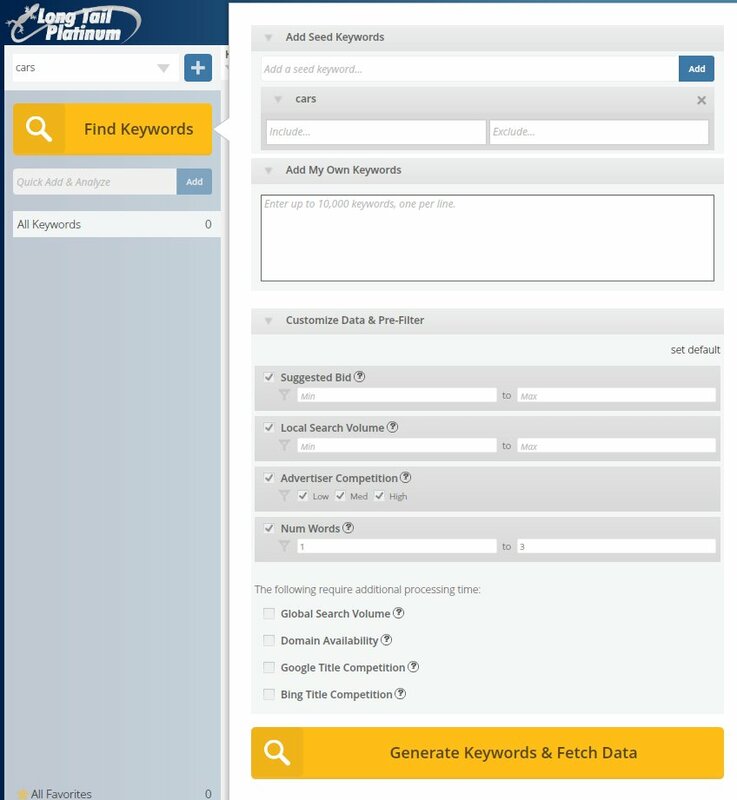 Once you've completed your targeting options, just click "generate keywords & fetch data" to complete the process. In addition to those features, the software can produce LSI keywords. If you're not familiar with this, LSI stands for Latent Semantic Indexing. It's important because Google considers related words to your seed word important in how it views your page so being aware of LSI keywords are important as you develop any page on your website. This is information that when you are searching for your seed keyword, you will also get a list of other related keywords that can be used as you develop your content. This is information that would be very difficult for you to find manually on your own. 0 to 10: You'll rank for keywords at this level with "very" little work.. there's no competition here. 10 to 20: Very low competition. It's easy to rank here too. 20 to 30: Low competition - If you find a keyword in this range with any kind of volume, attempting to rank for it isn't a bad idea. 30 to 40: Moderate competition - Still not bad here either, but it'll take a little work to rank. 40 to 50: Medium competition - We're starting to enter the big leagues, so expect to put in some work to rank for keywords in this range. 50 to 60: High competition - There's likely to be good volume with keywords at this level, but that also means that there's high dollars to be made here too. 60 to 70: Higher competition - You're going to work long and hard to break into the first page of Google for these keywords, but the payoff is going to be worth it. 70 to 100: Steep competition folks so you better step up your SEO game if you're going to play at this level, because these folks are spending major dollars to stay on the first page of Google for keywords in this arena. Common wisdom is don't even try ranking here, but some of us love a good challenge and ranking here is a lofty goal. Think of it this way.. if you're a website that has decent content, you've been around for at least 6 months and you've done a little bit of good whitehat link building, you can "typically" rank in the first 3 pages of Google for many search terms with a keyword competitive score of less than 30. Anything beyond that is going to take some work. I'm not making any guarantees since "every" niche is different and everyone's approach to ranking their website is different too, but it gives you an idea. Nevertheless, this is the tool that will give you the insider information that will help you collect the data that you need to target those low hanging fruit type of keywords. On page authority, we're simply talking about how strong the page is that is ranking for that keyword. Long Tail Pro generates the top 10 websites ranking for any keyword that you want to analyze. It will generate a number from 0 to 100 for each page it lists in your report. Here is an example of results with high page authority. This number also provides an indication of how easy this page could rank regardless of the content on it's page. Stronger page numbers means it'll be hard to outrank them. Alternatively, this is an example of what you may see when many of the results produced have low page authority. This is simply the number of links that are juice passing or not and all we're talking about here is whether the links are dofollow or nofollow. Dofollow links pass link juice from the originating source to the page where the link has been placed. On the other hand nofollow links do not pass link juice. This is a good measure of how many links you may need to compete for top positions for any website keywords you're trying to rank for. Additionally, this can give you an idea of the strength behind the linking structures of the top 10 pages ranking for your targeted keyword. This section tells you how many external links are passing juice to this page. These are all dofollow links, so if you're finding a lot of links in this section that means you're going to have to invest time and work into building the same type of links to compete here. Keyword ranking data like this becomes far more insightful when you understand how many links you're going to need to stay in the race with your competitors. This is basically the new page rank. Google's old ranking system would give you an idea of how strong or credible a website was and this could be ascertained from understanding it's pagerank (PR). Since Google has ditched that metric and no longer updates it, "domain authority" was introduced and became the new standard for measuring the strength and credibility of a domain. Domain authority is on a scale of 0 to 100. The higher the DA, the stronger and more trusted a website is. The lower the DA, the weaker and less trusted a website is. In Long Tail Pro, this metric represents how likely content is going to rank on a page. So with that said, if the DA is very strong then that page is likely to rank with very little effort. If you see pages with weak DA's then that might be a metric to pay attention to, especially if your website has stronger domain authority or is on par with the data that you're seeing in Long Tail Pro. If your domain authority matches other domains in the top 10 for a keyword search that you've performed, then that may be a keyword to try to rank for. You will find very often that websites such as Youtube, Ebay, Amazon etc. have DA's of 100. It doesn't mean that you should stay away from trying to rank for keywords where you see these sites show up in your data report because a lot of times they haven't done anything in the way of keyword optimization which ultimately means there's an opportunity for you to rank for that keyword. This is another metric that is similar to measuring how authoritative, strong and trustworthy a website is in looking at the quality and strength of a websites incoming links. This is also on a scale of 0 to 10. Websites improve their scores by getting links from popular to very popular websites. Nevertheless, if your competition has a high Moz Rank, you're going to have to build high quality links to compete. Building authority takes time and is something that Google pays very close attention to. Pages that have high Moz Rank and high DA's have a lot of authority and will easily outrank websites that have lower authority. The bottom line is that they simply have greater ranking power. Keep this in mind while you're engaging in keyword discovery using the Long Tail Pro keyword suggestion tool. You are going to get a lot of data but on the topic of Moz Rank, you're better off targeting keywords with lower Moz Rank especially if your website has low authority. Now I know that I discussed this earlier in the domain authority section and stated that Google ditched this, but it is included in Long Tail Pro because they still want you know what the page rank of the website page is. I typically look at this section simply for informational purposes and nothing more because the domain authority is the current standard. So while the PR is among the sections whereby Long Tail Pro provides data, if I were to offer a suggestion, I'd stick to looking at the DA (domain authority) and PA (page authority) rather than the PR. This section tells you how long ago the domain was created. It is no secret that Google ranks older sites better than younger ones. With that said, this is my favorite metric to look at because no matter how much linking a website has done, no matter how many page links or juice links it has, this metric is going to tell you very quickly how easy or difficult outranking them is going to be. If you're a website that has been around for 2 years, the likeliness of you outranking a website that has been around for 15 years is slim. Nevertheless, there's always exceptions and if a website ranks well for a term and hasn't done anything in terms of keyword optimization, there's your loophole and a way to get your keyword ranking on the first page right next to one of those aged domains. Long Tail Pro has a built in rank checker. Within the keyword checker, you simply input your domain, the keyword that you want to check on, set the delay between Google requests (it's 2 by default), set your country (it's United States by default) and language (it's English by default) and click "check ranks". The keyword ranking tool will show you your domain, search term, Google keyword ranking, Bing keyword ranking and Yahoo ranking in the table. If it's more than 500 results in, it will display (500+), but anything less than that will be reported in the table. With that said, Long Tail Pro is packed with useful data for your keyword research. You would be hard pressed to find another keywords tool that is as accurate and useful. Even in regards to finding a premier local keyword tool, you can perform the same research and search keywords for local terms with this software too. Nevertheless, there are certainly alternatives to Long Tail Pro, however if this recommendation and overview of it's features still leave you speculating about whether this is right for you, the software does allow you to test drive it for free before making any purchasing commitment as well. As I've mentioned before and I'll say it again, I'm recommending this software because I know this is something you are going to use and it is going to make your data research time much more efficient. 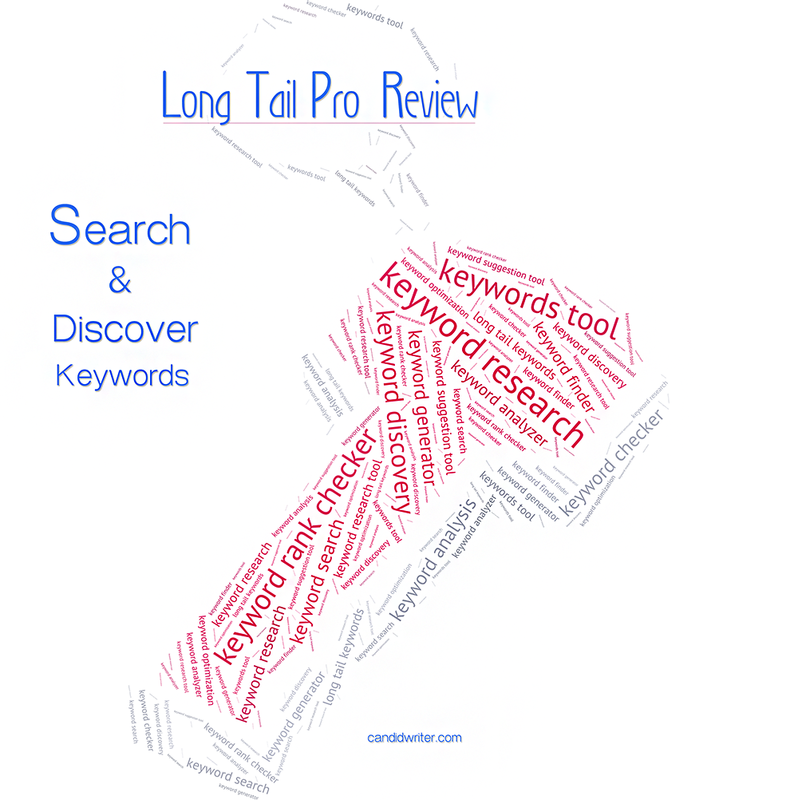 This is going to be a go to tool for you until something better comes along, but for now Long Tail Pro is the top keyword research and keyword suggestion tool that's going to make you wonder how you did keyword research before without it.